Hosting a party can be stressful for so many of us ... especially when deciding what to serve to our guests. 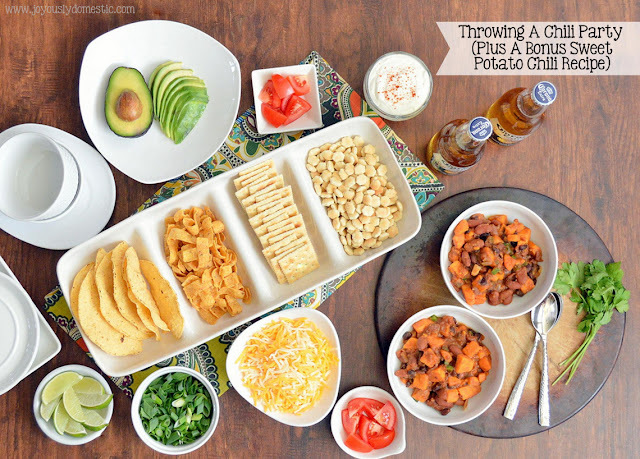 Setting up a chili bar when entertaining is so much fun and a total crowd-pleaser. The pressure is off of the host during the party and it allows for a casual environment wherein everyone can serve themselves while building their own ultimate bowl of chili. It's the perfect way to entertain when having friends over for game day or movie night. Do as much of the prep work/chopping/plating in advance. Even the chili can be made a day in advance, then reheated. For an especially large crowd, consider preparing two or three varieties of chili (a vegetarian version, a traditional version with ground beef and/or a white chicken version). Have guests each bring a different topping (or two) if you don't want all of the work upon yourself. Consider hosting a mini chili cook-off. A few guests can bring their own pots of chili, then party-goers can sample them all and vote for a winner. Use a slow cooker to keep chili warm. Cornbread muffins are a great accompaniment to the chili. To take things even farther, consider serving baked potatoes and/or hot dogs (with buns) alongside the chili. Guests can load up their taters or dogs with chili and provided garnishes. Keep things casual. Set out with the mindset from the beginning to have fun with your guests and enjoy yourself. With a little planning and maybe some pitching in by your guests, hosting a Chili Party doesn't have to be stressful. If you're looking for a hearty, healthful and comforting chili that's easy on the wallet and incredibly simple to prepare, this just may be the recipe for you. We all know that chili is one of the ultimate dishes to make during cool weather. So, grab a pot and seize the moment. This really is a no-fuss recipe that takes just minutes to get going and only a short amount of cooking time. It's an easy recipe to double (or triple) as needed, so it's perfect for feeding a crowd. And, even meat lovers will cherish this vegetarian delight. The sweet potato addition lends bulk to the chili and, also, brings a hint of sweetness that perfectly balances out the little bit of spice present. A medley of canned beans, a few basic vegetables, some crushed tomatoes, just the right combination of spices and a faint sprinkling of cocoa powder all marry well with the sweet potato chunks in this amazing recipe. In a Dutch oven or large stockpot, heat olive oil over medium heat. Add in onions, peppers and sweet potatoes. Heat - stirring occasionally - for 2 - 3 minutes while vegetables begin to slightly soften. Stir in garlic, chili powder, cumin, cayenne (if using), cocoa powder, salt and pepper. Heat - while stirring- for a few minutes while spices slightly toast and become fragrant. Stir in beans and tomatoes. Reduce heat to low, cover and cook for 30 - 35 minutes or until sweet potatoes are just cooked through. Check and adjust seasoning. Turn off heat and allow chili to "rest" for about ten minutes prior to serving. Divide into bowls and garnish as desired. If serving chili at a party, consider keeping it warm in a large slow cooker. Yeah I love potato chili and going to try this recipe. I will be hosting a family party at an outdoor venue Houston TX and will make all these vegetarian dishes for my guests. Thanks for sharing these ideas as they were very helpful.